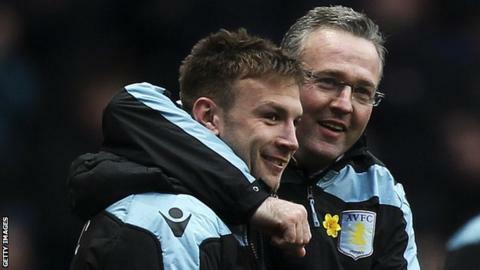 Aston Villa striker Andreas Weimann has signed a new three-year contract. The 21-year-old Austria international, who joined Villa's academy from Rapid Vienna at the age of 15 in 2006, is now tied to the club until 2016. Weimann's new deal comes on the back of him scoring 12 goals last season, eight of which were in the Premier League. "I'm really happy that I've signed. I love the club and it's been brilliant for me, for I have a feeling of being at home here at Aston Villa," he said. "I did not expect at the start of the season it would go the way it did, with me being involved, starting games almost the whole way through. "It was exciting to be part of the team's development because the potential within this young, exciting team is really strong." Signed for Villa aged 15, having started his career at Rapid Vienna. Aug 2010 - Handed Villa debut by caretaker boss Kevin MacDonald as a late substitute for Ashley Young in a 3-0 win over West Ham, before appearing again in a Europe League tie against Rapid Vienna five nights later, only to suffer an ankle injury. Jan 2011 - Went out on loan to Watford, scoring four times in 18 appearances under Malky Mackay. Aug 2011 - After early season Carling Cup appearance, returned to Watford on loan, before coming back to Villa to feature more regularly under Alex McLeish. March 2012 - Scored his first goal for the club in a 1-0 win over Fulham, also scoring a beauty in a late-season 1-1 draw with Stoke City. Sept 2012 - Got his first Premier League start under new boss Paul Lambert and was rarely out of the team from then on, scoring 12 goals in 38 games in all competitions, including a brace against eventual champions Manchester United. Weimann follows the lead of another of Villa's promising youngsters, Nathan Baker, in signing a new deal. He added: "Like the other young players in the team, I want to keep improving as a player and keep pushing Villa as high as we can in the Premier League." Manager Paul Lambert said: "He got a sustained run at it last season and he showed the quality that marks him out as a natural finisher. He definitely knows where the goal is. "Whether Andi Weimann is on x amount of money or not, you'll always get the same player. He has drive and a hunger to succeed and that's vital. That's what we're looking for here at Villa." Weimann, who has made six appearances for Austria, added: "I feel like I owe the manager as he backed me last season after he came in. "The supporters, too, have been brilliant with me. They've really taken to me, which I'm delighted about. "I've been here for six seasons now, having started with the academy in 2006, and it's great to be a part of an exciting future at Villa. "We stuck together last season. Having so many young players helped because we grew together as a team. "I'm sure the manager will bring in more new faces to make us stronger."